One of my favourite things about blogging is discovering new baby and toddler brands, especially clothing. I do like buying on the high street but I also like having clothes for my kids that I don't see lots of other children wearing. I was aware of the Zippy Suit brand before as C actually owned one of their fabulous bandana bibs when he was little. 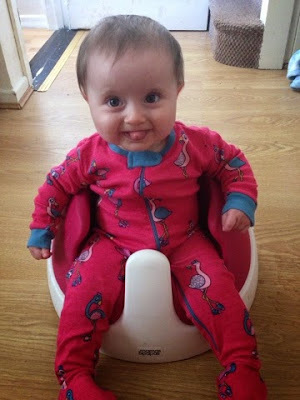 E was recently given the opportunity to try out one of their beautiful sleepsuits. 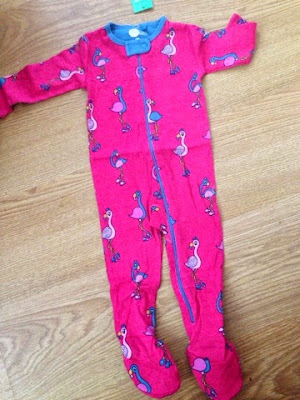 We received the Fabulous Flamingoes printed Zippy Suit in size 6-12 months. As per the company name, the sleepsuit doesn't have poppers but has a single high quality zip in place of these. I've found this really handy. E is quite an active baby and she is constantly kicking her feet. This leads me to struggle to do her poppers up and when I do, they end up being buttoned wrongly! The zip fastener means that all I need to do is pop her legs in, zip it up and there we go! It even has a zip cover to protect your baby from it. E tends to chew on the zips of her coats so the cover is a great addition. The suit is 100% cotton and it is luxuriously soft and stretchy. I actually put E in it as soon as I opened it out! She looked and seemed very comfortable. It is quite thin but I don't think that's a bad thing. I always worry about overheating so I can put this on E and have her in a sleeping bag at night without having to worry. I mentioned that this is a 6-12 month suit. She is almost 8 months old (but quite long) and this fits perfectly. It doesn't drown her but there is also room for her to grow. 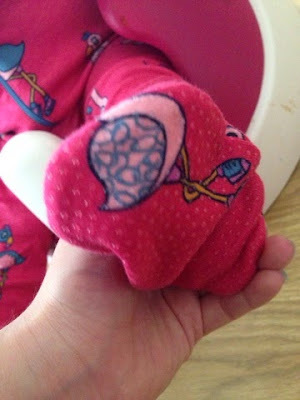 It is machine washable and can be tumble dried. I am in love with this suit and I might be a little biased but, isn't she so cute!? The Zippy Suit is also available in Alarm Clocks and Mice About Town designs. You can also buy matching bibs and hats too! The Zippy Suit retails at £15.00 and you can purchase them at the Zippy Suit website. You can also keep up to date on Facebook and Twitter.